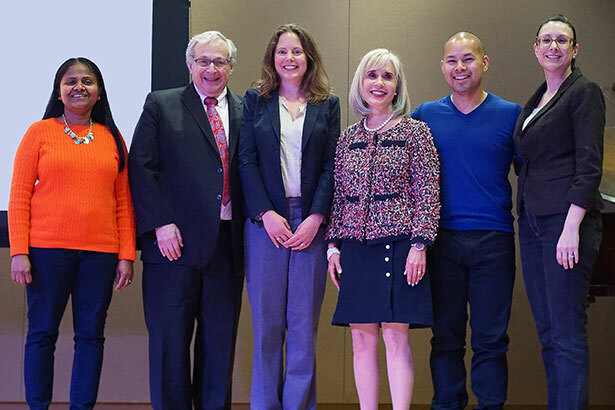 Dr. Jamuna Rajasingham, Dr. Harvey Gross, Dr. Samantha Hutten, Carol Silver Elliott, Dr. Rikki Racela, and Dr. Lauren DeNiro come together for a community update on Parkinson’s research. Dr. Rajasingham, Dr. Racela, and Dr. DeNiro practice together at Bergen Neurology in Englewood. Dr. Gross is the medical director of the Jewish Home Family and chief of the department of family practice at Englewood Hospital and Medical Center. Dr. Hutten is senior associate director of research programs for the Michael J. Fox Foundation. And Ms. Elliott is the president and CEO of the Jewish Family Home. April 26, 2018 – In recognition of Parkinson’s Awareness Month and growing concern about treatment and quality-of-life options for those with Parkinson’s disease, Englewood Hospital and Medical Center and the Jewish Home Family partnered with The Michael J. Fox Foundation to present the latest updates in Parkinson’s research. With one in 100 people over age 60 living with Parkinson’s disease, 60,000 new cases to be diagnosed this year, and an estimated 14 million projected for 2040, Parkinson’s is the most common neurodegenerative disorder next to Alzheimer’s. Samantha J. Hutten, PhD, senior associate director of research programs for The Michael J. Fox Foundation, discussed clinical breakthroughs; the latest research in therapeutics, medications, and biomarkers for diagnosis; and the relationship between genetics and environment, including risk factors. As the largest nonprofit funder of Parkinson’s research, The Michael J. Fox Foundation is focused on understanding the biology of the disease to develop new therapies and treatments for those it serves. Due to the highly variable nature of the disease, no two people with Parkinson’s are the same. There is currently no objective test for the disease, so diagnosis is often the result a clinical exam. But many patients see their family physicians—rather than a neurologist or movement disorder specialist—and often have their symptoms confused with those indicative of other chronic conditions. A combination of environmental, genetic, and lifestyle factors increase a person’s risk of developing Parkinson’s. Genetic mutations can make us more susceptible to the disease with exposure, explained Dr. Hutten. For this reason, the foundation has been exploring ways to treat the source of the problem. Recently approved treatments, including medications delivered orally and by direct infusion to the small intestine, aim to keep levodopa levels consistent, thereby controlling symptoms more consistently and avoiding side effects. Other new therapies work as “add-ons” to levodopa, helping avoid the natural breakdown of dopamine so it can function longer and alleviating dyskinesia. Other treatment options are currently under review by the FDA. These include an levodopa inhaler and a thin under-the tongue strip of another drug (apomorphine) to quickly alleviate symptoms during “off” periods, and botulinum toxin for decreased saliva production to prevent drooling in Parkinson’s. Equally important, Dr. Hutten noted, are various non-motor symptoms: cognitive impairment and dementia, urinary problems and constipation, depression and anxiety, vision disturbances, speech and swallowing problems, smell loss, fatigue, hallucinations and delusions, low blood pressure, pain, and sleep disorders. Walking and balance problems also are difficult to treat with available therapies. Advancements in treatment of these symptoms include cognitive behavioral therapy for depression and anxiety in Parkinson’s; retinal studies tracking eye movement for vision problems that affect gait and balance; transcranial magnetic stimulation for pain; swallowing, breathing, and voice exercises to increase clarity and volume; the use of cocoa extract for fatigue; and a fiber supplement for delivering proper bacteria to the gut. Additional treatments are being repurposed from other fields. Drugs approved for diabetes, cancer, high blood pressure and inflammatory diseases are currently being explored for use in Parkinson’s. Through its Parkinson’s Progression Markers Initiative study, The Michael J. Fox Foundation collects clinical and biological data, specimens, and important information—from those with and without genetic mutations linked to Parkinson’s—to investigate biology and develop new tests to diagnose and track the disease. Dr. Hutten explained the significance of such objective tests of Parkinson’s disease—called biomarkers—which ultimately could transform clinical care and fuel clinical trials. Scientists are looking for differences in body fluid and tissue, imaging changes in the brain, and wearable device data to diagnose and track Parkinson’s. Following the presentation, Dr. Rikki Racela of Bergen Neurology and Dr. Harvey Gross, medical director of the Jewish Home Family and chief of the department of family practice at Englewood Hospital and Medical Center, joined Dr. Hutten on a panel to answer questions from physicians, medical professionals, and members of the community. Strong themes included the impact of exercise on prevention and slowed progression of Parkinson’s; the importance of an expert care team and family support system; and the benefit of getting involved with the Parkinson’s community, research opportunities, and clinical trials. To learn more and watch the presentation recording, visit facebook.com/englewoodhealth.